So maybe you're not a cook. Maybe you don't want to spend your holiday in the kitchen. Or maybe you're a foodie and you want to catch a special menu. We get it — you want to dine out this Thanksgiving, and we say dine on! Put on those stretch pants, grab a fork and knife, it's turkey time and these restaurants mean business. If Thanksgiving is your day to let loose and eat up, by all means, dig into the holiday buffet at Park Chalet. For $39 per person ($19 per child), you'll get bottomless champagne, turkey, and all of the fixings. The buffet will include butternut squash soup, brioche stuffing, roast turkey with gravy, house smoked salmon with flatbread — the list goes on! A dessert buffet at Park Chalet includes pumpkin cupcakes, chocolate dipped strawberries, and bread pudding. With the combination of endless of champagne and food, you just may have to wheel yourself out of there. At Beach Chalet, you'll get to celebrate on the water and dine with a view of the Pacific. 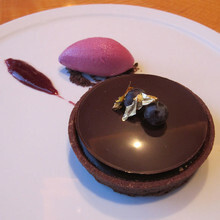 For the same $39 per person ($19 per child), Beach Chalet is offering a three-course prix fixe. Entrees include traditional roasted turkey, roasted rack of lamb, seared scallops or a vegetarian strudel. Both restaurants will be open from noon to 10pm and are currently taking reservations. Chef Bridget Batson has put together a great takeaway turkey alternative for Thanksgiving dinner. For $45 per person, you can purchase a full meal with rich fall flavors to be reheated right at home in just 20 minutes. A percentage of the proceeds will go to the local charity, Project Open Hand. The meal starts with a Sugar Pie Pumpkin Lobster Bisque with Spiced crème Fraiche that is lush, velvety and complex in flavor. 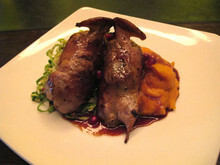 Chef Batson's Iberian twist comes with the entree, Tolenas Farm Quail with Herb Stuffing and Pomegranate Glaze. The quail is cooked sous-vide style and comes stuffed with baguette and sage. Sweet potato puree, and shaved Brussels Sprouts accompany, and we promise, you won't even miss having turkey. The meal ends on a sweet note with pumpkin bread pudding topped with pumpkin seed brittle. Orders can be placed online or via phone, now through November 22, and can be picked up on the 24th after 3pm. Meals come with heating and serving instructions so you can relax and indulge. $85 per person ($40 for 12 and under) may seem like a lot to spend on Thanksgiving dinner, but let's be real — this is the biggest meal of the year! And what better place to have Thanksgiving out than at a roasthouse? 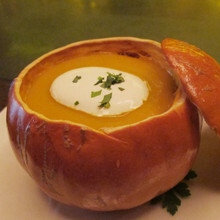 This year, Epic's four-course meal begins with a smooth, butternut squash and lobster bisque. The second course is lighter and includes such seafood options as Laughing Bird Shrimp Salad on Brioche, and House Cured Basil Gravlax with Paddlefish Caviar and Arugua Salad. There are four options for the main course, but if you're smart, you'll opt for the wood oven roasted Mary's Organic Turkey with Andouille Cornbread Stuffing, Candied Sweet potatoes, Crispy Fried Spinach, and Black Pepper Cranberry Sauce. If you still have room for dessert, Epic is steering away from the traditional pumpkin assortment and offering Banana Crème Pie, Ginger and Pear Cobbler, or Hazelnut Meringue and Chocolate Ganache Napoleon. Reservations are available for 12:30pm to 6pm in the dining room and Grand View Terrace Room. Either way, you'll have a stunning view to go with your decadent holiday meal. The bar will be open for walk-ins. Sure there's turkey and stuffing and pie, but we all know good eats need to be washed down with good drinks. Luckily, mixologist Sierra Zimei, takes holiday drinking very seriously. Known for her quirky cocktails at Seasons, Zimei has some special Thanksgiving libations that are sure to get you celebrating. The Pilgrimage includes Wild Turkey Rare Breed bourbon, POM Wonderful juice, sweet vermouth and honey, shaken with ice and poured into a chilled cocktail glass with sunken black currants. If Brandy is more your weapon of choice, try the Pumpkin Martini — brandy, Frangelico, simple syrup, cream, and her special pumpkin spice mix. In the dining room, Seasons will be serving a three-course lunch from 11am to 2pm, at $75 per person ($35 per child). Dinner will be four courses, from 5pm to 9pm, at $95 per person. To go along with your cocktails and turkey, Pastry Chef Jeffrey Wurtz's artful desserts will be the highlight of this meal. The menu features several dessert options including Chef Wurtz' play on a peanut butter and jelly sandwich. If you're looking for a last-minute holiday getaway, make a day trip up to Napa for the family-style Thanksgiving feast at Farm in the Carneros Inn. From 1pm to 8pm the restaurant will serve a four-course prix fixe meal at $55 per person ($35 per child). Free Range Petaluma Turkey will be served as the entree for the evening and sides include caramelized brussels sprouts, honey poached cranberries, and grilled corn bread. In addition, there will be a dessert buffet with pumpkin, pecan and apple pies, as well as a chocolate fountain. Best of the Rest: Ame, RN74, Passion Cafe, Bourbon Steak, Franciscan Crab, Le Colonial, Tommy's Joynt, Presidio Social Club, 1300 on Fillmore and Palio d'Asti are also serving Thanksgiving dinner. More information can be found on their websites.